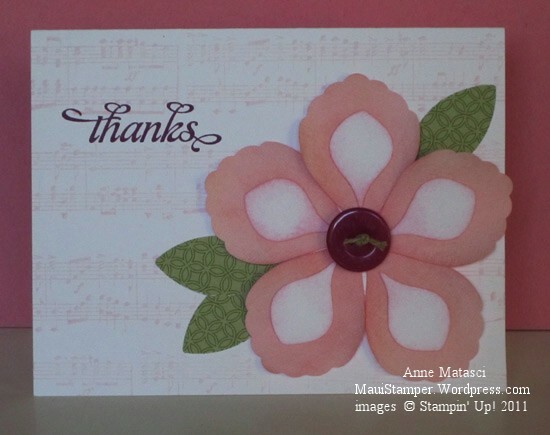 I used the sponges to add some texture to the flower petals with Pirouette Pink and Pretty in Pink ink. I’m starting to like the Hemp Twine for these buttons, too – I’ve used Linen Thread in the past, but when I ran out of thread I switched to twine. I like the bulk in the knot, and since that button isn’t going to pass the USPS quarter-inch test I figured I might as well go for broke. And I think I made a good call on the Wheel Guide – it’s hard to fake it when your lines of music are wavy. These soft colors seemed to beg for a pop of color, and I started with a little Daffodil but it just wasn’t enough. Razzleberry was the solution – and the button and the “thanks” are the same color in person. I’m gradually resuming my “regular” schedule. My middle daughter is home through the end of this week and then off to spend the semester abroad in Spain, so I’m enjoying these last few days together. It was an absolutely gorgeous beach day today and we were all lazy as can be, reading books and watching the whales. Yesterday was the opposite – we did the Piiholo Ranch Zipline! I’ll share photos of that soon. Check out this mini for yourself and see if you can resist all these goodies!